This memory is of my great uncle Sydney J Cullen, who`s retirement clock I have Inherited. 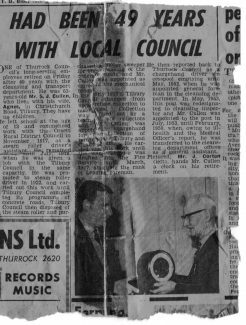 One of Thurrock Counicl`s long-serving employees retired on Friday after 49 years with the cleansing and transport department. 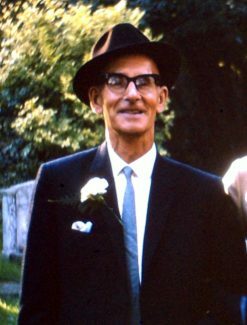 He was 63 years old MR.S.J.Cullen who lives with his wife Agnes,in Christchurch Road Tilbury.They have no children. He left school at the age of 13 and commenced work with the Orsett Rural District Council in November 1917 as a steam roller driver`s assistant. He remained there until July 1918 when he was given a job with the Tilbury Council in the same capacity. He was promoted to steam roller driver in 1922, and carried out this work until Tilbury council completed its programme of concrete roads .Tilbury council then disposed of the steam roller and purchased a motor sweeper for the cleansing of the concrete roads and Mr Cullen was appointed as driver of the mechanical broom. 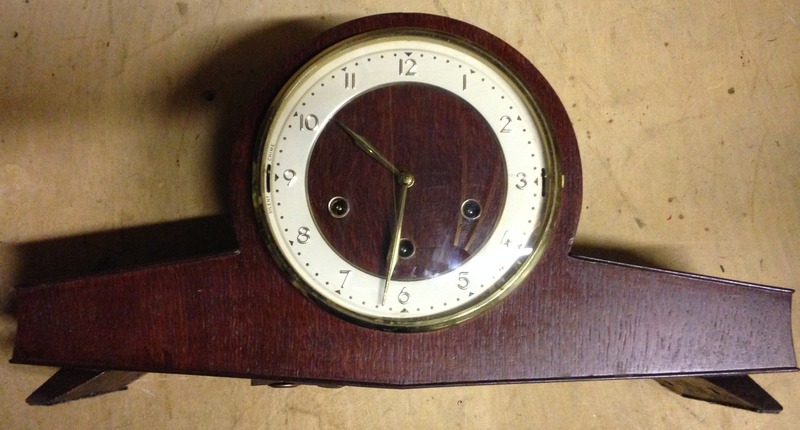 In the early 1933`s Tilbury council changed from horse refuse collection to mechanical. Collection was carried out by a team of six collectors and Mr Cullen was appointed chargehand for the collection of refuse for the Tilbury and Chadwell areas.He carried out this work until the war when he was drafted into the fire service until march 1947 attaining the rank of leading fireman. 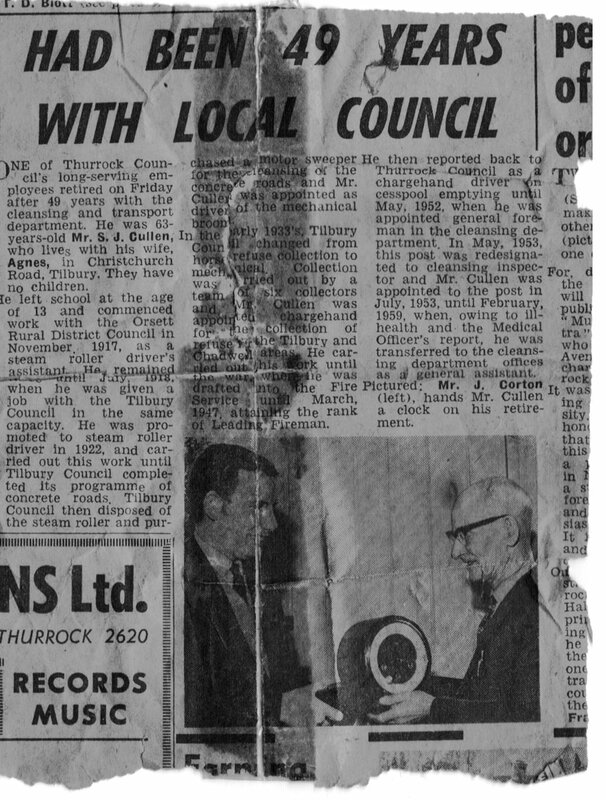 He then reported back to Thurrock Council as a chargehand driver on cesspool emptying until 1952, when he was appointed general foreman in the cleansing department.In May 1953 this post was redesignated to cleansing inspector and Mr Cullen was appointed to the post in July 1953 until February 1959 when owing to ill heath and Medical officers report he was transferred to the cleansing department offices as a general assistant .